This is the local pick up option for orders to be picked up in Charlotte, NC. After you place your order we will contact you when it is ready for pick up. Most order are available for pick up same day if placed before 11 am. NC sales tax of 7.25% does apply. List your shipping address as 655-H Pressley Rd , Charlotte, NC to avoid delays. Our Training Colored Bumper Plates provide a lower cost alternative to our Elite Competition Color Bumper Plates. 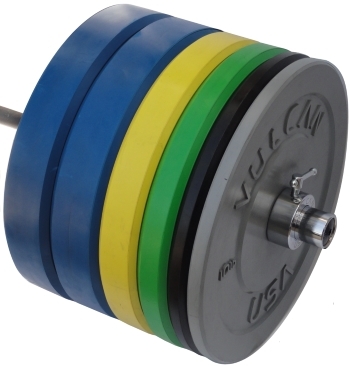 Our Color bumper plates mimic the true colors of Olympic competition plates as mandated by the International Weightlifting Federation - IWF: Red 55 lbs (similar to Red 25kg), Blue 45 lbs (similar to Blue 20kg), Yellow 35 lbs (similar to Yellow 15kg), Green 25lbs (similar to Green 10kg) and lastly Light Grey 10 lbs (similar to White 5kg training bumper). We felt that due to the frequency of training in the various gyms and schools we supply and the fact that most of these plates will be dropped on black rubber, we decided the Light Grey was the best for appearance sake. · Made to IWF (International Weightlifting Federation) Standard diameter 450 mm (17.7165 inch).